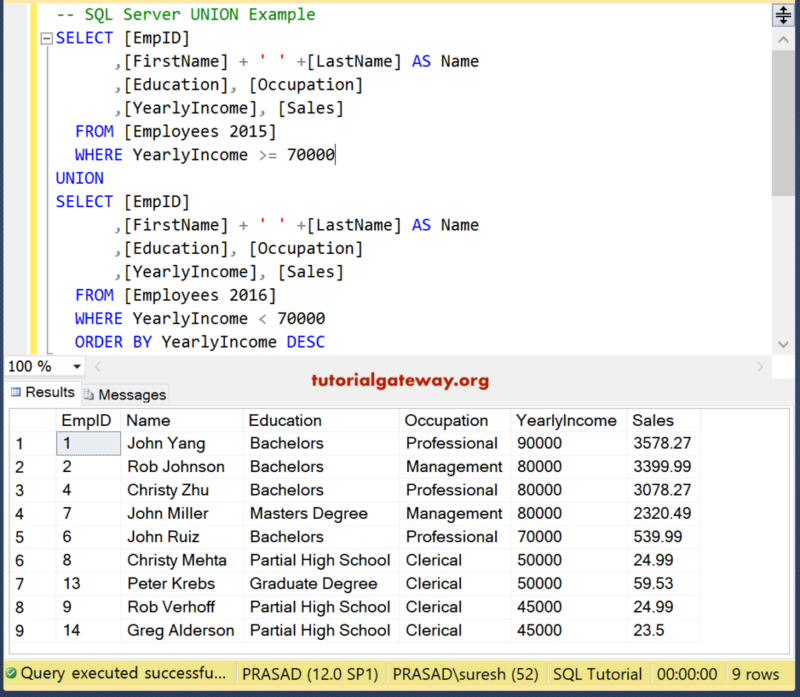 The SQL Union query is used to combine the result set of two or more SELECT statements into a single result set. 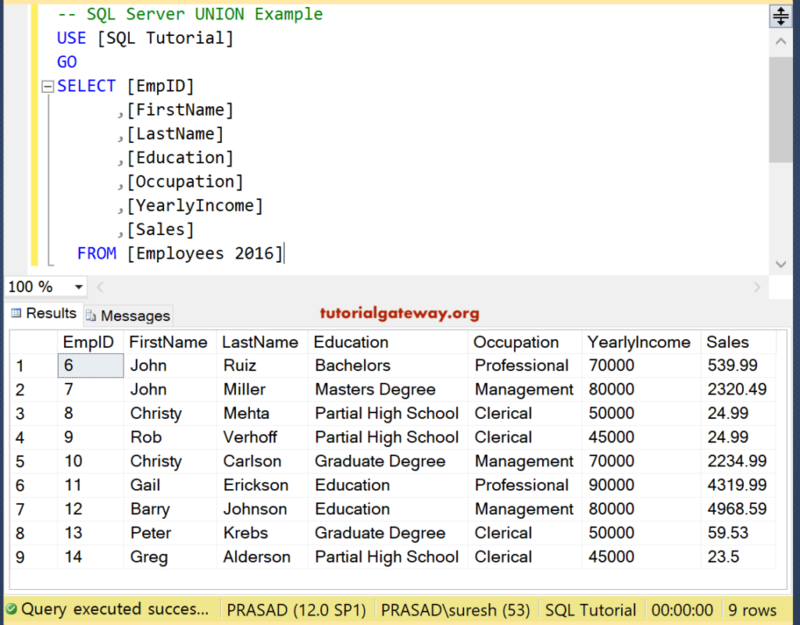 Union in SQL will select all the distinct records from all queries. The number of columns must be the same in all the queries. 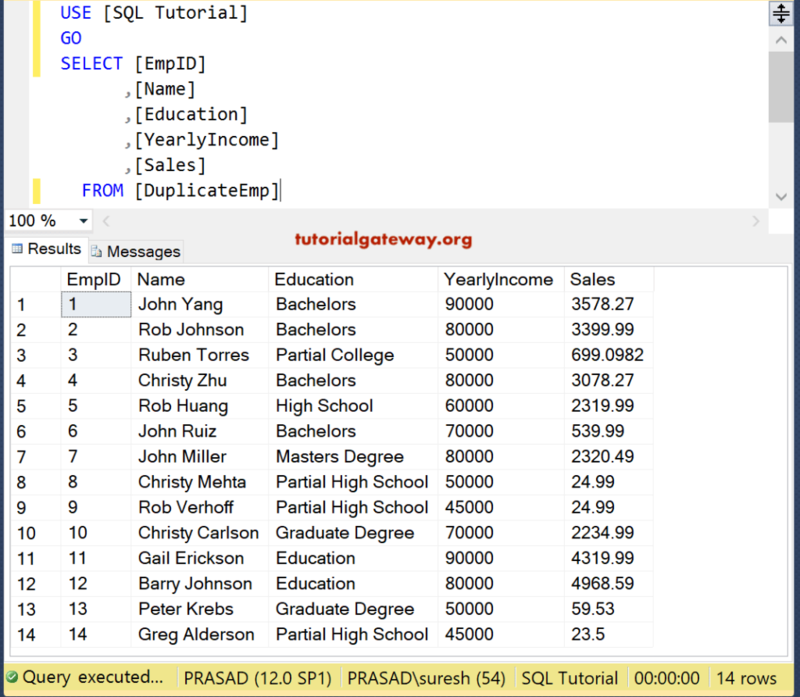 The column data types should compatible with each other. Columns order must be the same in all the queries. 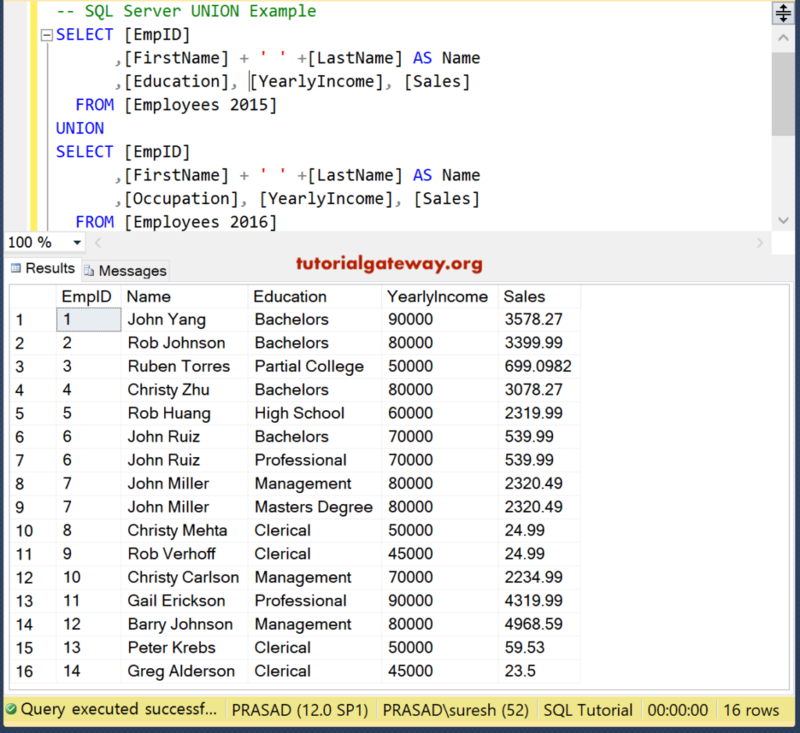 In this article, we will show you, How to write SQL Union query with an example. 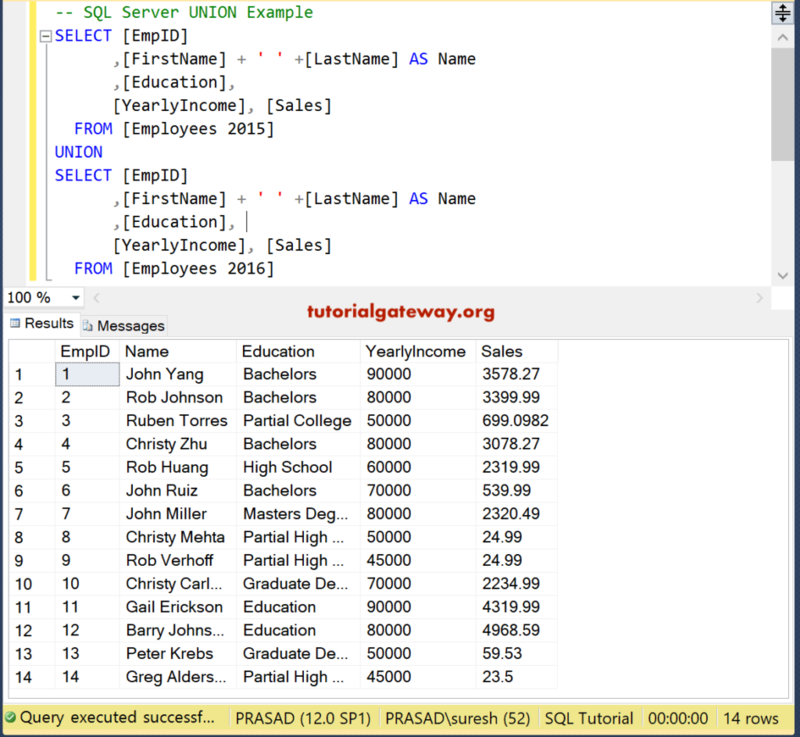 For this, We are going to use two tables (Employees 2015 and Employees 2016) present in our [SQL Tutorial] Database. 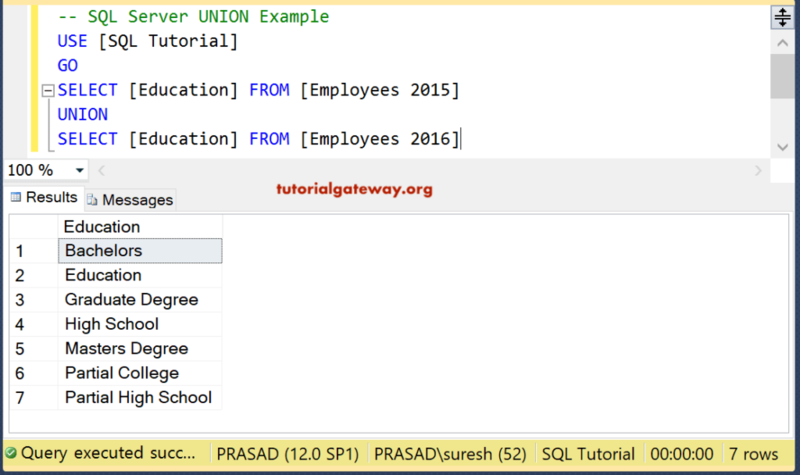 In this Sql Server Union example, we are combining Education column from both those tables. 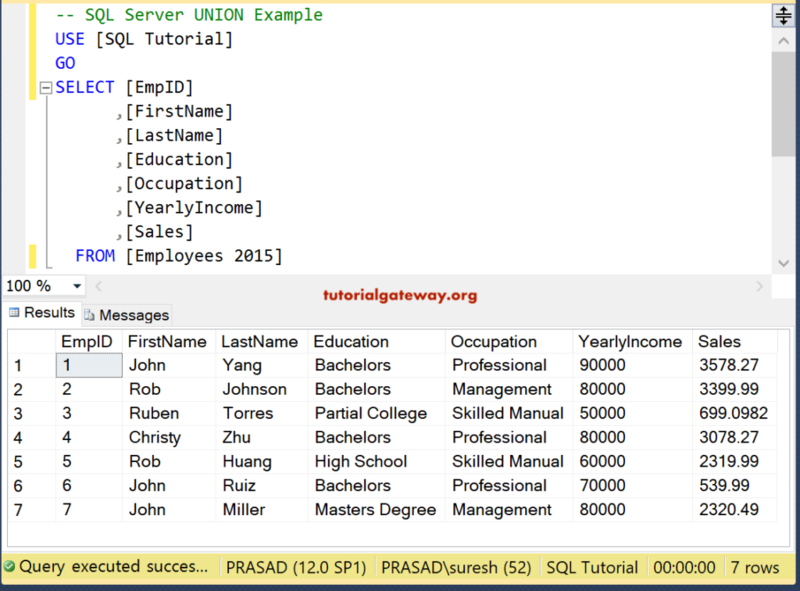 In this example, we use this Sql Server Union to combine multiple columns. 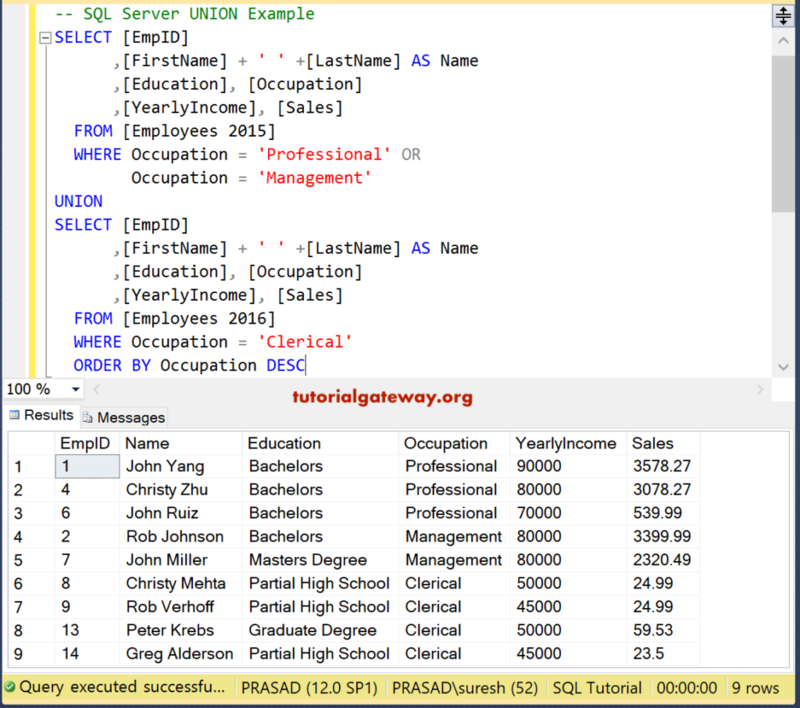 In SQL Server, you can use the Order By Clause along with this UNION operator. Here, Order By clause will sort those query result based on the yearly income in descending order. You can also use different columns in the Where clause. Here, first query returns records whose yearly income is greater than or equal to 70000. The second query returns employees whose Occupation is either professional or management. 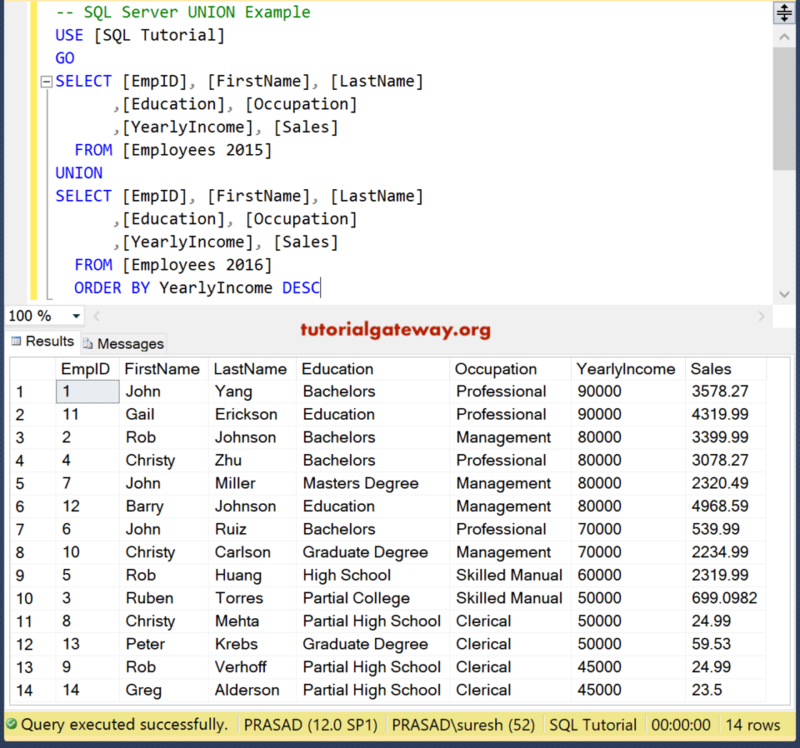 The SQL Server also allows you to use a different column name from different tables. As long as they are of same data type there will be no issue. 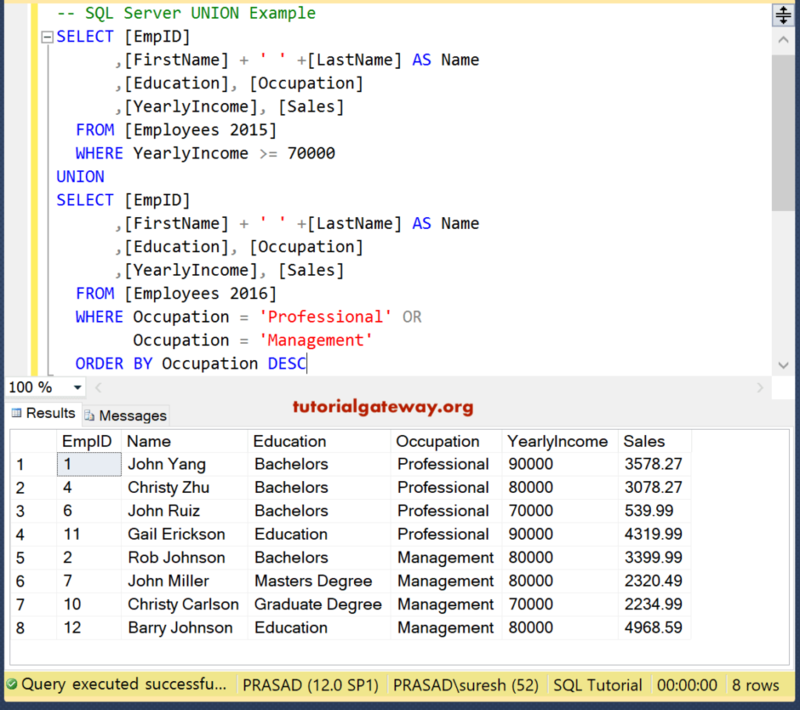 Remember, the result will take the first query column name. However, you can use ALIAS columns on both the statements to add your own column name. 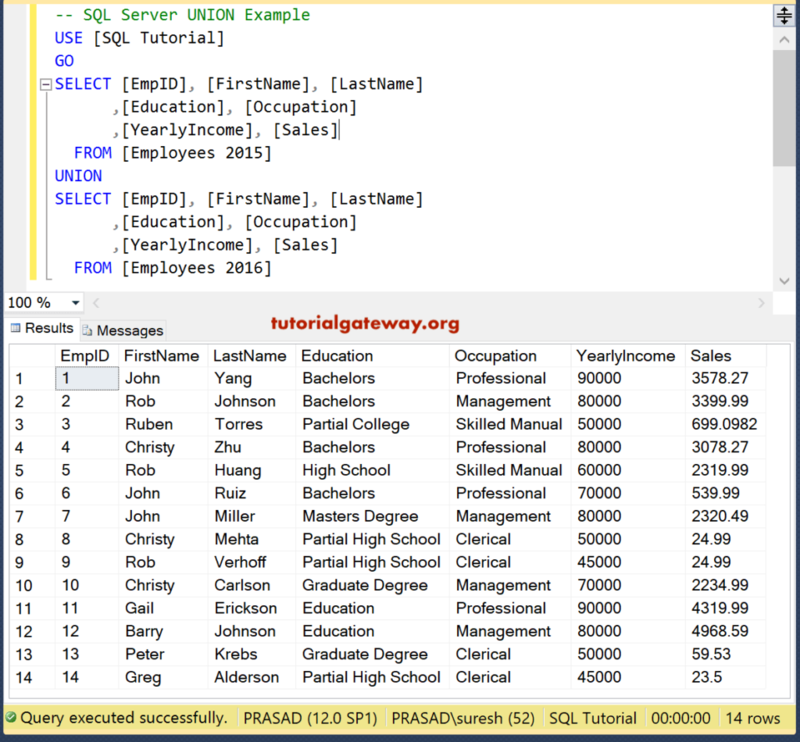 The following SQL Query will combine the result of Education from 2015 and the Occupation column from 2016. 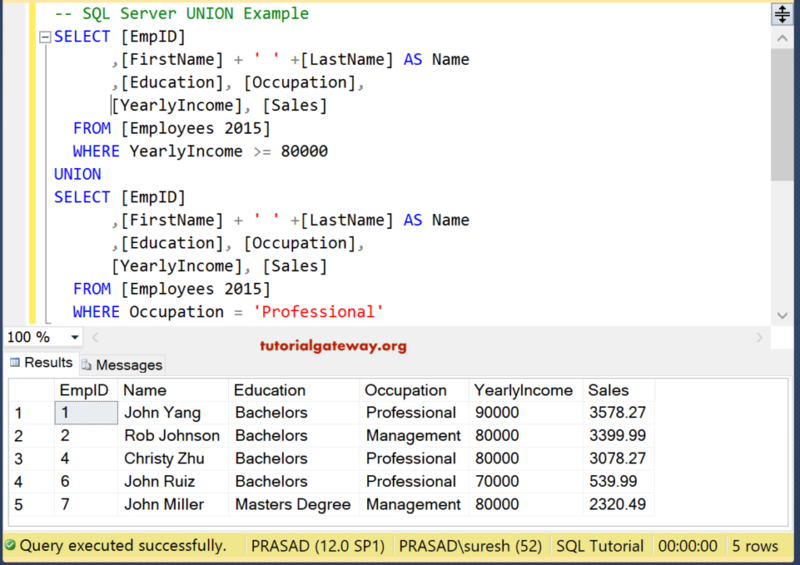 This example demonstrates the common errors encountered while writing the Union in SQL server. Let us see what will happen when we perform union operation on the unequal length of columns. Hope you can read and understand the message. From the above screenshot, you can observe that it is returning 14 records because there are duplicate records in Employees 2016. And our Union operator selects distinct records only. You can also use this UNION inside a Select Into Statement. 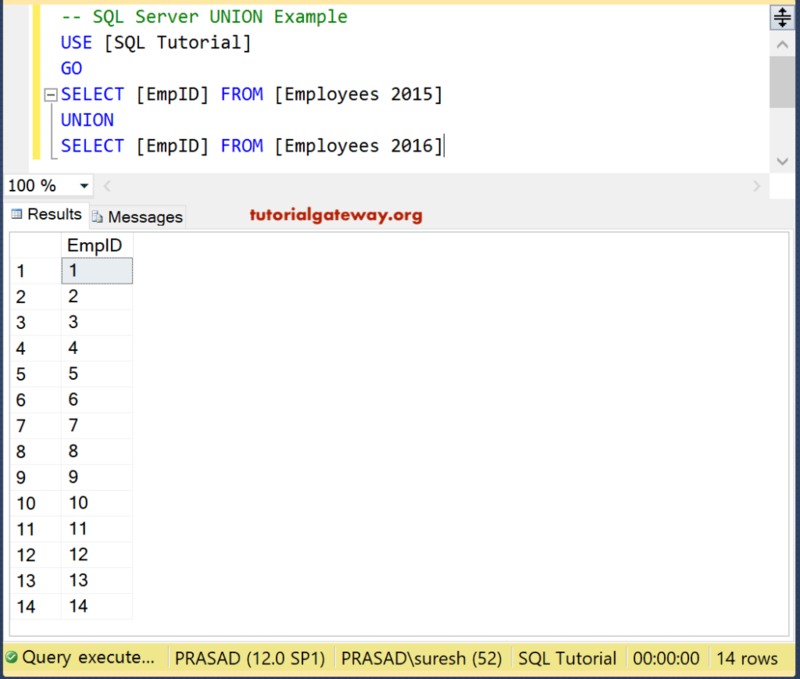 The following Query select and insert the Union result into the Duplicate Emp table.